You are here: Home / How Earth Works / What is Fog? 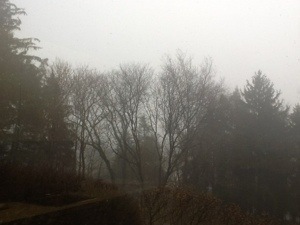 Here in the Delaware Valley, the last several days were thick with fog. The air had the misty look of a fantasy film. You can imagine hobbits whistling as they stroll along a shady path cushioned by pine needles or hear the galloping of a horse as a handsome elf advances toward you. But my mystical fantasy imaginings do not match the magical reality of fog. Fog is water vapor that hangs in the air and takes different forms. It can become frost, dew, fog or clouds. Fog is a collection of tiny water droplets that float in the air or near the earth’s surface. It is the water which evaporates from bodies of water such as oceans,bays, lakes and rivers. 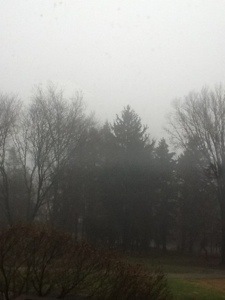 Moisture evaporating from plants and soil adds to fog. Fog is basically a cloud that touches the ground. We can walk through something that is usually thousands of miles above us. Fog and clouds are made up of the same material, water vapor. Fog forms when moist air cools. When the air cools and there is more water vapor in the air than the air can hold, the water vapor begins to change into small droplets of water, transforming into rain. Fog disappears as the air temperature rises. This explains why fog is often seen in early morning and “burns off” (evaporates) as the sun climbs higher in the sky, warming the air. The fog didn’t burned off yesterday. It was just as cloudy at noon as it was at sunrise yesterday morning. I find it disorienting when I can’t see the sun or moon. It is almost as if I can’t tell which way is up.